PRODUCT DESCRIPTION: Odorless concentrate classified as a "non repellent" which means insects won't know its present where applied. This means you can use this active without spooking or chasing insects elsewhere. 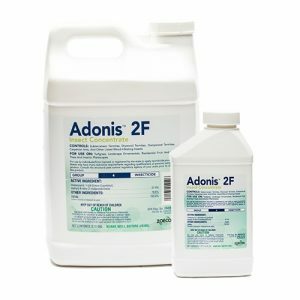 Designed for use inside and outside the home, Adonis is a good active for "communal" pests like termites, ants and most any garden or turf pest around the home like grubs and beetles. WHERE TO USE IT: Inside the home Adonis can be applied to structural members infested with wood destroying pests, wall voids and sub-slab for termite prevention. In the yard, treat the soil around the home as well as grass, mulch and gardens. 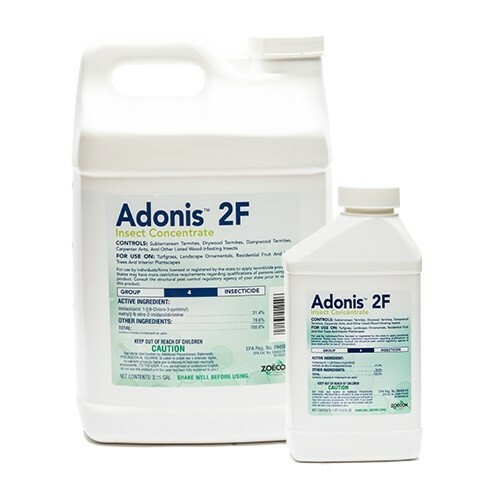 Adonis can also be used as a systemic on trees and shrubs for long term control of wood boring pests and insects which target plant foliage. RATE OF APPLICATION: When spraying it out over grass or foliage, add .3 to .6 oz per gallon of water. When soil drenching shrubs and trees, use .1 – .2 oz per inch of tree diameter. 1-2 oz per 10" of tree width. Add the chemical to a 5 gallon bucket filled with 3-4 gallons of water. Make 4-8 holes for every bucket you need to use so for a tree 20" wide, you should use two buckets and 10-15 holes around the tree. Use a stake, something like rebar, to create holes 1-2 feet deep. The liquid should then be poured out over these holes slow enough so the holes will absorb the fluid evenly. When treating for termites, mix 1 oz in 2 gallons of water and apply the 2 gallons of mixed solution to every 10 feet of foundation around the structure. Dig a small trench prior to treating to insure the material stays in place during the application. Retreat every 5 years. For flower beds, plant foliage and turf, .3 to .6 oz per gallon of water per 1,000 sq/ft will control most pests. When treating ants in the yard, add 2.5 oz to our 20 GALLON HOSE END SPRAYER and then fill the sprayer up to the 5 gallon line. Hook the sprayer to a garden hose and spray the entire tank over 5,000 sq/ft. Retreat monthly when ants are seen until they are gone. Once gone, treat every 2 months to ensure they do not return. TARGET PESTS: Adelgids, Ants, Aphids, Billbugs, Carpenter Ants, Chafers, Chinch Bugs, Cutworms, Grubs, Japanese beetles, June Beetles, Lace bugs, Leaf beetles (including elm and viburnum leaf beetles), Leafhoppers (including glassy- winged sharpshooter), Leafminers, Mealybugs, Oriental Beetles, Psyllids, Sawfly Larvae, Thrips (suppression), Weevils, Whiteflies, Wood Borers and Woolly Adelgids just to name just a few. I was wondering if it would be possible to add this insecticide with Grazon Next, around May or June of next year to control acorn weevils. I would be spraying in open woods, mostly white oak trees, similar distances between trees like a park, 20-25' apart. How much would I need to add to the tank since it will be rated for the output necessary for the herbicide, it will require higher volume output. Using a 55 gal. spray tank, PTO.